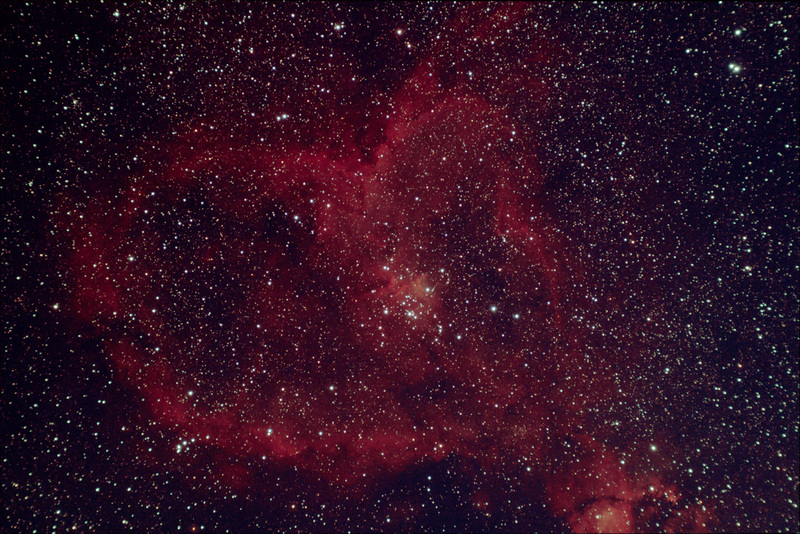 This is the Heart Nebula, also known as IC 1805, imaged on the evening of 25th January 2014. 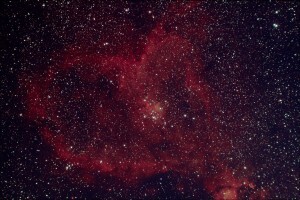 It’s an emission nebula in the constellation of Cassiopeia, which is a counterpart of the nearby ‘soul’ nebula. This is the most ‘whispy’ and faint nebula I’ve attempted yet, and it’s definitely a bit harder to pull out the detail here and maintain a nice low noise level in the picture. This consists of 1hr40mins of subs, each 4 minutes at ISO 800. It was taken with the 1100D through the 80mm f/6 Revelation semi-apo refractor with the CLS filter. It was guided using the finder guider and PHD. I also took dark, flat and bias frames. I’m pretty happy with the result of this considering, but I’m definitely going to try it again at some point. It needs more data to bring out the fainter areas without the noise increasing too much. This isn’t a bad first try though…!